Don't Feel Like Reading Today? Here's A Quick Rundown Of The Makita Table Saw Review. This Makita Table Saw comes with a powerful 4,800 RMP 15 ampere motor and a high quality 32-toothed blade and a riving knife. Makita provided an add on stand combo that has brakes to lock the table. With the Makita 2705 model a 30 days no questions asked Makita official replacement/refund policy is included. Makita has certainly stood up to the mark in terms of quality, durability and long term results with this table saw .Ideal for DIY project enthusiasts, on-contract carpenters, re modelers and homeowners. There’s a strong and valid reason for labeling Makita 2705 as a “contractor” category table saw. You can actually pursue your desire to be a master craftsman by bidding for professional grade contracts in the market. Yep, this Makita table saw has just the right amount of professionalism amalgamated in a cheeky little package where, I think, any amount of DIY and other project builders can feel comfortable. 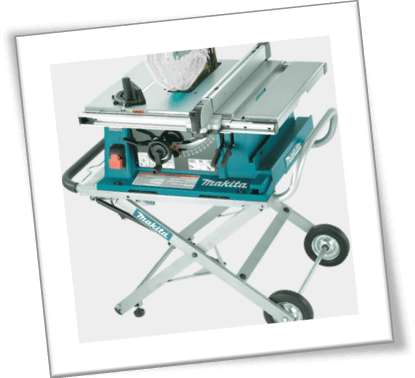 This is not an in depth Makita 2705 10-Inch Contractor Table Saw; I like to think that anything beyond 2000 words is a detailed review of a product. Take this article as an introductory account of someone’s first few days with an entirely new and different Makita power tool. I am not new to cutting tools because I have used Makita, Bosch 4100-09 , Dewalt DW745 and other brands’ saws before. It’s another thing that those saws are spread over different categories, such as; Makita chainsaws, Makita circular saws and pole saws. If you are interested, you can read my other reviews by browsing around at this website. At the moment, I have a Makita 2705 10-Inch Contractor Table Saw at my disposal. It was sent as a loaner unit by a friend, so I thought about giving this sick pupper a stroll around the garage. What If I am Clueless On Parts Installation? Who is This Table Saw For? The Makita 2705 10-inch table saw arrives in a big box. The actual saw has a staggering diameter of 76 cm width, but the box is slightly bigger due to additional protective packaging. Unboxing is easy; Makita closed everything in separate cardboard compartments. You will need a paper cutter to get through the nylon straps and additional tapes etc. Some people think that a Makita table saw weighs like a sack of bricks, but I was able to lift it single handedly. It might be a two man job to move the entire Makita 2705 Table Saw assembly from one place to another, but I was impulsive at the time of unboxing and couldn’t wait for my wife to come back home. She would have helped me lift and place the unit on our worktable. But, oh well… never mind. Anyhow, the entire build quality is impressive. You get a spare set of everything ranging from wrenches, blade guard, washers and spanner keys for tightening + loosening the riving knife screws. The table saw also has a separate gauge meter which needs to be installed at the lower half area on the front side. It is hard for me to explain everything without visual cues, but you will get a rough idea of how to place and install everything correctly. Yes, there is a possibility that you may not be able to assemble the Makita 2705 contractor table saw for the first time. This normally happens to folks who have never used or unboxed a table saw before. To help overcome this cheeky little dilemma, Makita has enclosed a small instructions pamphlet, which you will find very handy in a number of sticky situations. 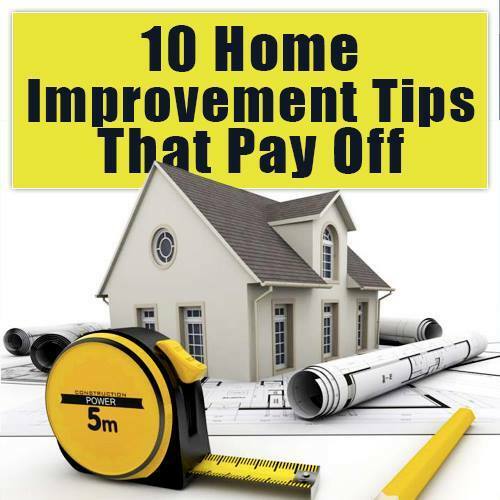 The installation process is explained with the help of diagrams and additional text explanation. Still, if you are not able to make sense of where a particular screw, or part is supposed to go, you can watch the Makita 2705 table saw videos at YouTube. These will help you out a lot. Makita is well known for helping users out with a variety of issues concerning company’s products. I am not saying that Makita products are faulty, but sometimes weird things can happen. It reminds me of the last time when my friend ordered a brand new Makita table saw; the model was inferior to the 2705 series though. Everything was okay until he noticed that the electric cords assembly was positioned lower than the actual level of the table saw. He was unable to place the saw back-to-back on a stand because the slightly lower position of the wiring required for him to make unnecessary adjustments. Anyhow, he called Makita, and they admitted that it was a rare manufacturer fault. The company sent in a replacement unit the same day without asking any questions. That’s how reliable Makita is! There’s no such thing as “help” in the carpentry industry. At times when you are thinking about creating your own furniture, or making a couple of book shelves, you will eventually need to get “hired help.” Obviously, the guy will charge you a fortune for basic level work which you could have done in the first place with your own hands. In this context, the Makita 2705 10-Inch Contractor Table Saw fits right in where DIY project enthusiasts, on-contract carpenters, re modelers and homeowners can conveniently get by with a reliable product. The table saw doesn’t boast too much on extra features, but it does come with a variety of essentials that are more than enough to create small projects at home without any hassles. 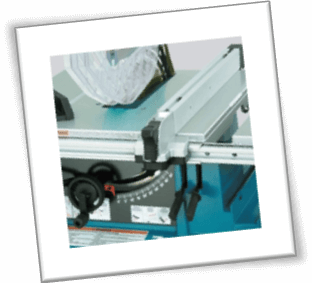 The Makita table saw 2705 comes with a high quality 32-toothed blade and a riving knife . The important thing is that you place the riving knife EXACTLY behind the toothed blade for precise results. I myself didn’t know about the riving knife placement until I saw a YouTube video for assembling this particular model. Moving on, Makita 2705 features a precision machined table top counter. It has a smooth levelled layout for allowing users to easily slide or move the wood sheets back and forth. I took the liberty of creating my own crosscut sled, which I have highlighted in a separate homemade video. The benefit of cross cut sled was not only additional safety, but also extremely precise results for small projects that require biscuit joints etc. ​Depending on your Makita 2705 10-Inch Contractor Table Saw order, you will get a translucent hard plastic blade guard cover. By default, it comes attached to the riving knife elbow. You can remove it during the circular blade installation part, or leave it be. The choice is yours. Do bear in mind that the blade guard is supposed to stay on the blade at all costs. Don’t worry, the guard is made in a semicircular shape with a swivel joint at one end. It lifts up easily whenever you slide a piece towards the circular blade. The purpose of the blade guard is to provide some level of limb injury protection against the blade whenever you are busy working. However, the guard itself is not a permanent long lasting safety solution. Makita also added an electric brake safety mechanism, but I also find it “useless” to some extent. The biggest safety precaution would be to keep your eyes open and maintain a safe distance from the circular blade at all times! You don’t want to slide in your hand while hastening a cut. ​There is a small rotary handle at the lower front side of the table saw. It rotates in both clockwise and anticlockwise directions. You will notice that rotating the “cuff” will cause the circular blade to lean on the corresponding side. For instance, if you are rotating the handle screw to the right side, the blade on top will also lean to the right side. Makita introduced this feature to help people with angle cuts. Sometimes you want a nice and precise diagonal cut, which is only possible if the circular blade is positioned at the right angle. This specific feature also pushes the precision factor to a whole new level. Makita 2705 10-Inch Contractor Table Saw comes with a 4,800 RMP 15 ampere motor. The speed is just right, if not perfect, to help meet the demands of general category project contractors. If you are interested in more revs, you can go for an alternate model in the market. For what it’s worth, Makita 2705 has a satisfactory RPM over most conventional table saw units out there. The tool less adjustment part is important in my opinion. Since I mentioned earlier that most of the hardware adjustments are possible by rotating or moving a certain part in a specific motion. Makita wanted to liberate users from the confusion of manually making adjustments to the core table saw parts, such as circular blade angles and vice versa. So they pre-installed corresponding movement mechanisms within the body of the table saw. Another friendly feature is the blade height adjustment. It comes within the same “tool less” category, since you are able to move the blade up and down with the help of a level located at the back side of the table saw. The blade position matters a lot in many projects. If it is exposed too much, you risk making higher/ deeper cuts than needed. If it is dug in deep, you end up making a minor sleeve category cut, which will cause you to rerun the slab again with added blade height adjustment. Extremely Versatile: Makita 2705 10-Inch Contractor Table Saw is made as more of an open ended “sand box” type product. You can add your own side accessories to enhance the user experience. Comes with 30 days no questions asked Makita official replacement/ refund policy. Priced just right for people who don’t want to end up with an expensive table saw. Comes with extra stand as an add-on unit. Of course you will need to pay the price difference. You can, however, create your own stand at home; it will save you money. Makita factory provided add on stand combo comes with brakes for locking the table in one place. Basic model comes without a stand. Sawdust gets stuck underneath the blade assembly rather quickly. May seem bulkier and heavier to users who have already owned other Makita table saws before. Some people have complained about the Makita 2705 10-inch Contractor Table Saw quality because of the “cast” body frame. Yes, it is correct that the frame seems fragile, but it is sturdy regardless. Don’t move the saw around too much to avoid any damage possibilities. Overall, I am satisfied with this table saw. Makita has certainly stood up to the mark in terms of quality, durability and long term results. This Makita table saw does require frequent maintenance, but what good is a power tool if it doesn’t need an extra bit of care? Good luck, and don’t forget to share your experience through the comments section below. When in doubt if this is the right table saw for you make sure to read our best table saw review and our complete table saw tool guide.